Javis Atchison, La'trell Holloway, Tiquan Williams and Tiaquelin Mims in the 4x100 Relay. Baldwin County Tigers in the Admiral Invite. BAY MINETTE, Ala. – Baldwin County High School Track and Field had another successful competition, earning six spots on the podium at the Gulf Shores competition on Saturday, March 16. The boys 4x100 relay team won first place. The team included Javis Atchison, La'trell Holloway, Tiquan Williams and Tiaquelin Mims. The boys 4x400 relay team took third place team with Keyon Palmer, Jordan Davis, Marvin Dixon, and Henry Blackmon. La'trell Holloway won first place in the 200-meet race. Javis Atchison and La'trell Holloway finished in second and third place, respectively, in the 100-meter race. The girls 4x100 relay team finished in second place with the team of Courtney Coleman, Canithia Bodiford, Niya Boykin, and Kaelieigh Boykin. 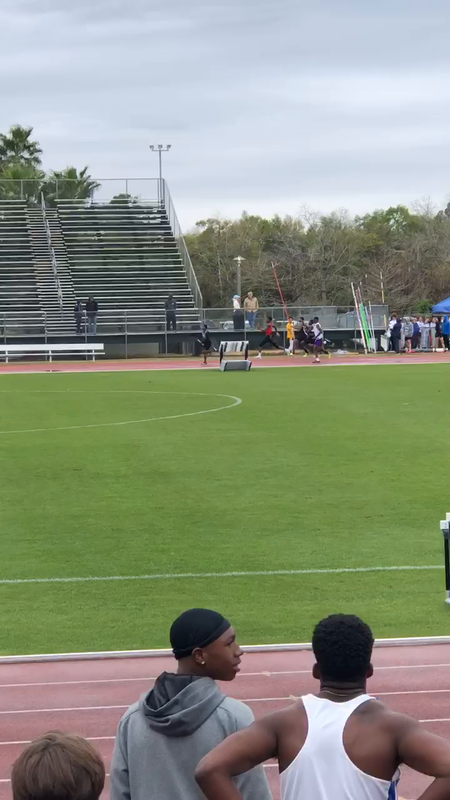 DAPHNE, Ala. -- Baldwin County High School's Track and Field team kicked off the season last week with an impressive showing, earning eight spots on the podium in the Bayside Academy Admiral Invite. La’trell Holloway sprinted to first place in the 100-meter dash and second place in 200-meter dash. Javis Atchison finished in second place in the 100-meter dash and third place in the 200-meter dash. Both were part of the 4x100 relay team that earned second. The boys' 4x100 relay team finished second overall. Relay members included La’trell Holloway, Javis Atchison, TyQuan Williams, and Tiaquelin Mims. The girls' 4x100 relay team finished third overall. Team members included Courtney Coleman, Niya Boykin, Kaelieigh Boykin, and Canithia Bodiford. Alondra Rangel finished in second place in both the 1600 and 3200 meter runs. Ethel Walker was second overall in the shot put. Now in his fourth year at the helm, Coach Graylin Hodge said this is his most talented team to date. "Our team has a lot of potential and I am looking forward to them getting better each and every meet," Hodge said. "The most athletes I’ve taken to the state meet in four years has been 6. We are looking to surpass that number with 10 or possibly more." Hodge said the team works hard and that results in success. "We have a ton of great young hard-working men and women that want to be great. There is no doubt in my mind this team will continue to grow and get better and will set a solid foundation for future track and field athletes to come." For more results visit: Al.Milesplit.com/meets.